This is just a quick update to let you know that I left the smog and heat of Kathmandu behind and have arrived in the Everest region. I have had an unusually fast trip as I got the chance to take a helicopter to Phortse, which lies at an altitude of 3,800m, which is already pretty high. The reason I was able to take the heli was that some of Russell’s Trekkers had finished their trip but were taking the heli to Kathmandu rather than walking back, which gave me the chance to jump on and have an easy ride up. In Phortse I had a quick cup of tea and a chat with Dorjee, who used to work for Russell and then I doodled off towards Pheriche (4,270m), where I am now. Of course, I can feel the altitude as the height gain is far too quick but apart from a slightly swollen face, I’m not feeling too bad. I will probably amble up to our Lobuje camp later today and enjoy one of our cooks’ good lunches and then press on to Everest base camp tomorrow. I am looking forward to being back up there and seeing old friends. I am also excited that two good friends of mine will come and see me up there. One is my photographer friend Alex Treadway, who took many amazing shots during my 2009 Everest expedition, and the other one is the ultrarunner Lizzy Hawker, I have been spending quite some time with in Kathmandu over the last few weeks. 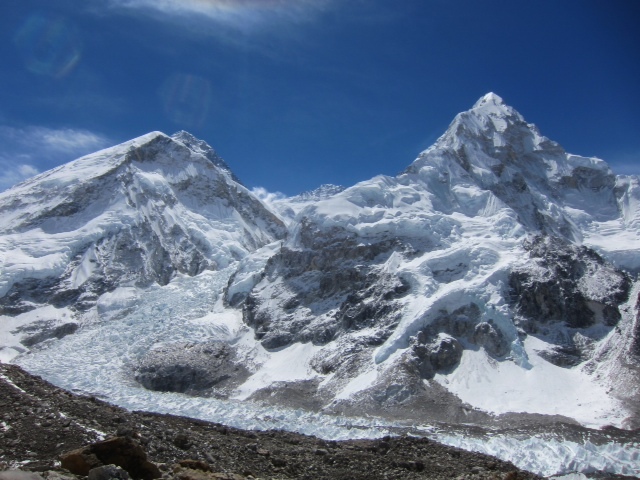 And of course, there is Nuptse – the mountain I am intending to climb with four other women and a mountain guide. I am extremely happy that Ellen Miller from the US will be on my expedition as Ellen and I have climbed quite a bit together. Furthermore there will be Jing from Japan and Martine from France, whose husband Francoise will be guiding us. As soon as Internet connections allow, I will update this site, however, you can also follow me on Twitter on @billibierling. In the meantime, I would like to thank my family for always letting me go and my friends, wherever they are in the world, for always makin me feel welcome when I come back – no matter whether they are In Kathmandu, Munich, Islamabad, Garmisch or Bern! I would also like to thank Outdoor Research for equipping me with outdoor gear and Valandre for keeping me warm with their downsuits and sleeping bags. And Kiku Apples from Lake Constance to support my expeditions and providing me with apples and great apple juice, when I am in Europe. And a very special thanks to my friend and web supporter Richard Bull, aka ‘The Robot’ for sorting out all technical glitches and making sure this website runs smoothly. Take care Billi. May your God go with you. Klingt sehr spannend – wünsche einen aufregenden Trip! All the best with blogging and of course, for the Nuptse climb.